Well, I created this so no more video game thread dominated by KSP. Post all your stuff related to Kerbal Space Program here. There's no need to post a link to the KSP website, if someone is posting in this thread then they know what KSP is already, and if they don't then they can easily find the site without a link. I'll start moving KSP-related posts here. So I know y'all are KSP fans and I managed to snag it in the server unrest and have promptly made it to Duna! They have tutorials in the new .17 update that are more interactive than the earlier ones. As for getting to Kerbin orbit, you might find my video First Orbit and EVA helpful. I also made an 0.16 video called Orbital Mechanics 101 designed to help non-mathy people wrap their head around the basic features of orbital maneuvering, though I expect you know all that stuff. I'm currently familiarizing myself with 0.17 before embarking on any further tutorials, but I'll probably do something on using the Attitude Indicator and a lesson on vectored-thrust Munar descents. Thats pretty neat. Orbits were never an issue, the issue is getting a nice even orbit and transfer orbits. I'll figure it out eventually. the issue is getting a nice even orbit and transfer orbits. I'll figure it out eventually. Make sure that your spacecraft is pointed prograde (into the direction of motion), apply a level of acceleration appropriate for you to watch the orbit change in the map and have time to react, then when it gets close to where you want it, close the map and cut the throttle. That will allow you to increase your apsides in a controlled manner. To decrease your apsides, do the same thing but retrograde. To change your inclination, point normal or antinormal, preferably at apoapsis, though this is not necessary for flying to Mun. A game that makes me hate rocketry. It used to be free but it is worth the money. The developers crank out new updates all the time and support mods. i've got the demo just now, and i must say that's quite some fun. yeah, i guess that's worth 18$, but my economic conditions ain't are what you'd describe "good". 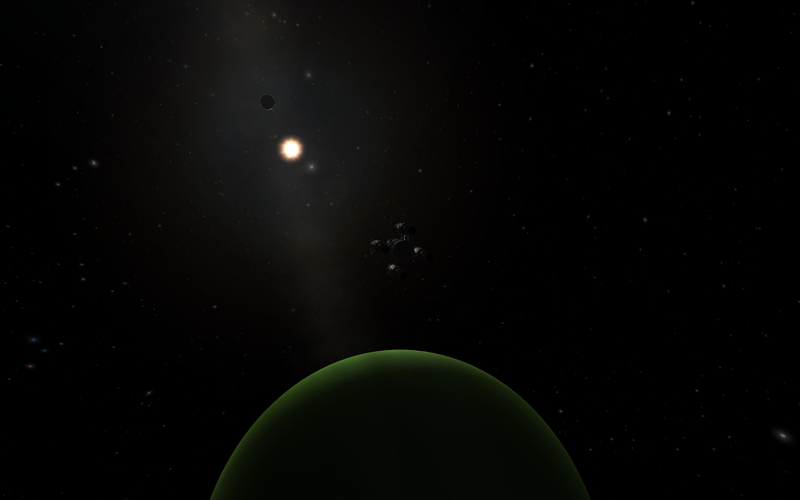 Jool! I'm keeping it strong in KSP! I'm keeping it strong in KSP! Kyle, do you (or anyone else reading this) have any issues with lag/low framerates when looking at the horizon when inside the atmosphere on Kerbin? Outside the atmosphere I get 40-60 fps, but inside atmo looking at the horizon I get 5 fps. I looked on the KSP forums and I found a few mentions of a similar problem, but the only solution mentioned there had no effect for me. I was just curious as to whether I was the only one. It may have to do with installing via the patcher as opposed to a full download install. I also have a glitch when using the MechJeb plugin that causes the game to hang when a stage runs out of fuel when MechJeb is active, but that's a different matter entirely. I do occasionally, but it isn't really that bad I might get 25 FPS or so for around 2-3 seconds but only while launching. Are your GPU Drivers up to date? This is the ship I launched to LEO recently. 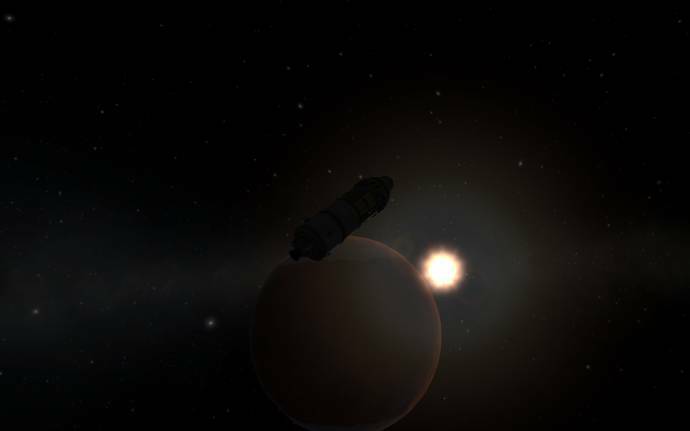 It is designed to land on and return from Duna, but technically, I believe, it is capable of going to one of Jool's moons and returning back - I'll check this later. It's weight is almost 200 tonnes with full tanks and it's launcher is so tall it touches the top of construction hangar. When I launch it from starting table, first stage with SRBs is going at 1 fps, second - at 3-5 fps and then up to 30. I've seen worse, however.